What is The EOS Cafe DAC? DAC stands for Decentralized Autonomous Community. 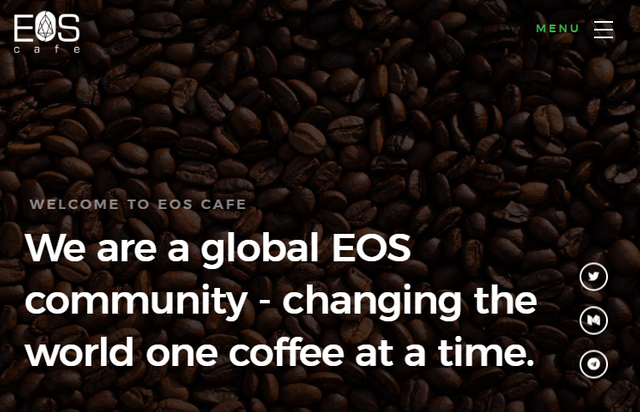 The EOS Cafe DAC aims to bootstrap a global network of collaboration spaces in the form of cafe locations where people can meet, learn, be creative, and celebrate EOS culture. EOS Cafe DAC is a self governing community operating under the EOS constitution and our own constitution. The DAC uses its resources to shape the world according to decisions made democratically by members. Is EOS Cafe DAC a Block Producer? No, EOS Cafe DAC is not a BP, it is a decentralized autonomous community. EOS Cafe DAC and EOS Calgary look forward the continued development of the EOS dApp ecosystem by collaborating on global projects put forward by the vibrant EOS Cafe community. BEANS are the utility tokens of the EOS Cafe DAC. They are used for both governance and for utilizing DAC resources. BEANS denote weighted democracy for decisions made by the DAC, and they can be staked or transferred for goods and services provided by the DAC. BEANS currently exists as a BitShares token, but when the EOS mainnet goes live, a new BEANS token will be created on the EOS Blockchain. In the coming days a smart contract will be created to convert any existing BitShares BEANS into EOS BEANS. No one will lose their BEANS as long as they can prove they control a BitShares account with a Beans Balance. How can I get BEANS? Beans will be airdropped to all EOS token holders based on a snapshot of the genesis block. If your EOS is held in a custodial service, we will work with them to the best of our ability to have your BEANS distributed accordingly. You can earn additional BEANS through actions that help the EOS Cafe. There are many ways to help, including participation in our logo and slogan contest, scout a location for a cafe, propose a dApp development and lead it to fruition, join the team in a proposed development and contribute to it, host a local meetup to rally interest, broadcast a conversation on our discord channel, and more! You’re already here which means you can find us on Telegram, Twitter, and Discord pretty easily. Follow up with the current goings-on of the community and find the best fit for yourself. What exactly are the terms of your partnership with EOS Calgary BP? In exchange for support from EOS Cafe’s founding team to help build the Block Producer infrastructure, EOS Calgary has entered into a short-term profit sharing agreement to help finance physical cafes in locations our members request. (Seoul, Lagos, Amsterdam, and many more). It is important to note that while the resources that these funds secure will be accessible to our global members who hold BEANS tokens, such as cafes, no financial distribution or payout will ever flow to our members or BEANS holders. In no way shape or form does owning BEANS entitle the holder to any direct profit from a Block Producer. Please see the “What is your stance on vote buying” FAQ for further clarity on this. What is your stand on ‘Vote Buying’? Vote buying is unacceptable. It erodes the network stability that we all depend on. It would be directly against our own financial incentives to risk the degradation of democratic competition between block producers. DAC members do not decide as a group which block producers to vote for. While block producers may sponsor the EOS Cafe DAC in return for permission to promote themselves as doing so, it is just that, a sponsorship with no quid pro quo implied. Imagine a dentist’s office sponsors a kids soccer team & they get a team photo to put in the waiting room. The kids don’t have any obligation to have their teeth cleaned by that dentist. The dentist promotes their practice as a community builder, which is an accurate reflection of what they’ve done. The dentist gains promotional material for their sponsorship, and the soccer team gets the money they need for uniforms and travel. That’s the entirety of the transaction. Don’t trust us, join us. Become a member of the EOS Cafe DAC for free by helping to bring the vision into reality, and help decide what we all build collectively. We’re not asking for your money. We’re providing you with an opportunity to participate. When can I buy BEANS tokens? We are a lean startup comprised of voluntarists. Realistically, digital projects do not really require capital to succeed, rather, they need skill and creativity and community. EOS Cafe DAC will succeed or fail together on the merits of our talent and hard work. We are not funding our operations with a token sale. we will not be able to restrain decentralized exchanges from trading in BEANS. BEANS tokens that might be listed for sale in the future will be done by someone who has earned them or received them in an airdrop. Revenue from the sale of BEANS tokens will not flow to the EOS Cafe DAC, rather, revenue will belong to the member who has sold. Stay tuned, it’s a collective project! The target release date is June 17th 2018. Congratulations on making it into the top 21. Hopefully you can help develop EOS in Alberta, Canada and the rest of the world. Good luck. 테디님 글을 제 스팀으로 옮길수있는 기술은 없나요? @huiosrealtors님께서 이 포스팅에 많은 관심을 가지고 있어요. 리스팀을 해주셨군요~!